For the last few years I’ve made a point to attend one photography workshop a year, and it’s been one of the best decisions I’ve made in my business. There’s always more to learn, a new perspective to walk away with, friends to be made, and a million chances to get inspired! This year I attended a Cinematic Portraiture workshop with the legendary Kurt Iswarienko at the Santa Fe Photography Workshops, and, to be blunt, it was f*king awesome. I will definitely be returning to the Santa Fe Workshops in the future. More on that another time. For now, I wanted to share some images I took in the days leading up to the workshop. Once I knew I was going out west, I HAD to take advantage of the chance to spend a few extra days doing some exploring. I think the Southwestern area of the USA is food for the soul - the landscapes are so diverse and beautiful, I’m basically in complete awe the whole time I’m there. I was introduced to the concept of “Thin Places” through someone quoting this article from the New York Times recently, and I’m kind of obsessed. Thin places are “places that beguile and inspire, sedate and stir, places where, for a few blissful moments I loosen my death grip on life, and can breathe again.” These are the places where “the distance between heaven and earth collapses and we’re able to catch glimpses of the divine, or the transcendent” or whatever it may be for you! I’ve been lucky enough to stumble upon many such places in my lifetime so far, and a lot of them have been in the Southwest! White Sands National Monument was absolutely this for me - I was basically in tears taking in the beauty as I drove in; miles and miles of dunes, sand so white it looked like snow glistening under a breathtaking sunset! I watched it in a state of complete happiness, toes in the sand and camera in hand. BUT - I’m skipping ahead! First I flew into Tucson and spent a few days there, and LOVED IT. Such a fun city to explore. Traveling alone is always a little weird - I honestly love it in some ways, not so much in others. It was great to be able to wake up early every morning and drive somewhere to watch the sunrise over the desert, explore and photograph wherever I wanted during the day, eat as many tacos as possible and not worry if someone else wasn’t in the mood for tacos (what the hell?? ), and finish each day watching the sunset before passing out in my hotel room right afterward. I was definitely a little starved for conversation by the time I left though haha, thankfully the workshop was next! So, my takeaway - if you haven’t been, Tucson is worth a visit! Spend lots of time in Saguaro National Park and definitely dedicate a few hours to the Arizona-Sonara Desert Museum. Wander through the botanical gardens, have lots of tacos, walk around the 4th Avenue District and pop into the Food Conspiracy Co-op. And if you get the opportunity - make the drive out to White Sands. It is absolutely in the middle of nowhere but it is worth every second spent driving (and driving along the scenic routes in that part of the country is half the fun)! Anyway, THIS BLOG POST GOT VERY LONG. Sorry for rambling. Here is a glimpse into my long weekend in Tucson + White Sands! Something a little different on my blog tonight! I couldn’t resist sharing a few of my favorite photos from this maternity session! Erika & Steven are such adorable parents-to-be, and they were beaming throughout this entire session! Erika was especially radiant in her red dress - I LOVE how the bright color popped against the snow and greenery in the background. I hadn’t shot much at the George Eastman House in the winter, but I can’t say I’m surprised that it’s still one of my favorite locations to shoot at, even covered in snow! Here are a handful of images of these two that I love - enjoy! Loved getting to hang out with Megan and Tom while I photographed their winter engagement session! They are so adorable together and they were all smiles despite being FREEZING! Even though it was cold, it was absolutely beautiful out and we wanted to take advantage of the white fluffy snowfall happening in Saratoga Springs. We started off in Congress Park before heading onto Broadway to wrap up the session, and I love this whole area of Saratoga so I’m a happy gal anytime I get the chance to photograph my couples here! These two are so incredibly sweet that they somehow managed to not laugh at me EITHER of the times I wiped out on the ice during this session. And these weren’t little slips, they were full out sprawled-on-the-ground-in-the-snow falls. Full disclosure; this isn’t even close to the first time I’ve fallen during a shoot (and I fully encourage everyone to laugh at me). Regardless of my new bruises, I had so much fun photographing these two and could not be more excited for their Saratoga wedding later this year!! Here’s a few of my favorite photos from this session - enjoy! You might be wondering why it’s March and I’m just posting a best of 2018 post, but it’s never too late right!? 2019 kicked off as busy as ever so admittedly time has gotten away from me a little bit in posting this, but I’m still so excited to share this collection of images with you all! These are not even close to all my favorite shots, it was incredibly hard to narrow it down! I had planned to cap off 2018 at 25 weddings/elopements, but couldn’t resist taking on a few extra for some really fantastic couples, so I ended up at 29! When I receive a heartfelt inquiry from a couple who would clearly be a perfect fit for me and my photographic style, it’s always worth making it work! What makes a couple a “perfect fit”?! My favorite clients to work with are always some combination of laid-back, kind-hearted, madly in love, and who know how to have a good time! These are the clients who really value photography and absolutely love the look of my artistic, joyful, light-inspired images. These brides have a great sense of style but aren’t worried about getting the bottom of their dresses a little dirty, they did all the planning and thinking through logistics ahead of time (and I am happy to help) so when the big day arrives they’re having the time of their life and not sweating the small stuff! They’re the kind of people I want to be friends with! I’m so glad this type of couple keeps finding me! When I look back on the year, I feel so incredibly grateful for each and every one of these 29 couples who trusted me to photograph their weddings. Thank you, thank you, thank you to all of my clients for being THE BEST – your beauty shines from the inside out! Most of the weddings I photographed in 2018 were right here in Rochester and the Finger Lakes, and then a little over a third of them were spread out throughout the rest of New York State in Long Island, Albany, Skaneateles, Saratoga, and Buffalo! That’s a pretty perfect ratio for me – being on the road too much when I’m swamped with work can get a little overwhelming, but I absolutely love traveling, seeing new places and photographing weddings at different venues! From a glamorous Gatsby-themed wedding at a historical mansion on the water in Long Island to a low-key elopement at a family farm outside of Buffalo, 2018 definitely brought lots of variety! There’s never a dull moment with all the different types of venues and scenery New York State has to offer, from wineries, ballrooms, barns, rooftops, golf courses, historical estates, to lakeside spots – 2018 was filled with all of the above! I’m starting to sound like a travel advertisement for visiting NY, so I’ll just shut up now and let the photos do the talking! Hope you enjoy! The above was taken at Bristol Harbour, which you’ll see a lot of in this post as I was lucky enough to photograph four weddings there this year! It’s definitely one of my favorite venues EVER! How incredible is that view!? This was my first wedding at the Hotel Lafayette in Buffalo, but it certainly won’t be the last! So in love with this venue! One change I made in 2018 was trying to always ask my clients if they’d like to do a backlit night photo like the above image from a Hall of Springs wedding in the spring, IF there’s scenery that would make for a good shot! These always end up being some of my favorite images! I had to include these flower girls in this post! They were so adorable and absolute hams for the camera!! I usually end up taking WAY too many flower girl candids but how could I resist?! Erin was one of the HAPPIEST brides ever and I can’t help but mirror her radiant smile every time I see one of these images of her beaming with joy!! Such an incredible wedding! Being a photographer is ALL about the light, and sometimes the sun is just exactly where you want it to be like for this one between the silos at Twin Silos barn! SUNSETS from the Strathallan Rooftop = EVERYTHING! It’s not very often that I get an opportunity to create an image like this, so when there’s fluffy white snow falling after dark during a winter wedding reception I am a very happy camper!! Doesn’t hurt that these two only had to take about two steps out the door to the back deck from their reception at the Lodge at Welch Allyn in Skaneateles for this shot! The shot above is from Jessie + Andrew’s elopement at Bristol Harbour and it was one of my all time favorite shoots ever! It was just the two of them, their officiant, videographer, and myself, and it was so incredibly intimate and special! The cake above is quite literally made of cheese, so I obviously had to include it in this post. Justin’s face when he saw Jacquelyn walking toward him on their wedding day gives me goosebumps! Such an incredible moment! I don’t even know where to begin describing this wedding day, it was SO special and I could never say enough good things about the newlyweds, Emily & Justin! These two are exactly the type of couple that make what I do so rewarding! They’re so sweet, kind, down-to-earth, and a ton of fun to be around! They met during their last year at RIT, and kept in touch through graduation, different cities, etc. but didn’t make it official until a few years later when a move back to Rochester put them in the same city! As they say, from there the rest was history! They share a love of sports, traveling, their pups, and of course their families and friends. It was so clear throughout the day how important their people are to them, and they’ve surrounded themselves with a fantastic group of supporters! It was wonderful seeing some other brides and grooms that I’ve photographed throughout the years at their reception, all of which have been some of my all-time favorite clients!! Their ceremony was at St. Jude’s Church and it was definitely one of my favorite parts of the day, especially the moment that these two officially became husband and wife! Afterward we headed over to the High Falls area for portraits of Emily & Justin and their bridal party, and I was thrilled we were able to do the majority of them outdoors! You never know what the weather will bring in Rochester regardless of time of year, but it’s especially uncertain in the winter. For Emily & Justin’s day, it was pretty much best-case scenario; there was a fresh blanket of snow on the ground, yet it was over 35 degrees! Their reception was at the Wintergarden by Monroe’s! This has become quite a popular Rochester venue (no doubt about why, it’s gorgeous!) so I was really excited to finally photograph a wedding there. I’m already so excited to be back in a few months when 2019’s wedding season kicks off! From the first dance through the parent dances and toasts, every moment was just so full of JOY! I’m pretty sure I grinned from ear to ear the entire time I photographed this reception. Their band was Something Else, who most Rochester folks are familiar with (because they’re amazing! ), and they had all the guests on the dance floor throughout the night! It was such an honor to play a part in this incredible day and I’m excited to share a glimpse into the celebration here with some of my favorite images! Enjoy! Stationary: Emily’s sister Amanda custom designed the invites! You remember that blizzard a few weekends ago when over a foot of snow fell throughout Central and Western NY and the temperatures were in the single digits?! Well, Katie & Seth’s wedding day was right in the middle of it. Did the weather prevent this from being an absolutely incredible celebration with loved ones from near and far sharing in love and laughter!? Not one single bit. In fact, it didn’t even stop this bride & groom from getting outdoor portraits!! I seriously could not be more thankful (or impressed) that these two were willing to freeze with me for a little while so we could go out in the snow, because it was BEAUTIFUL! 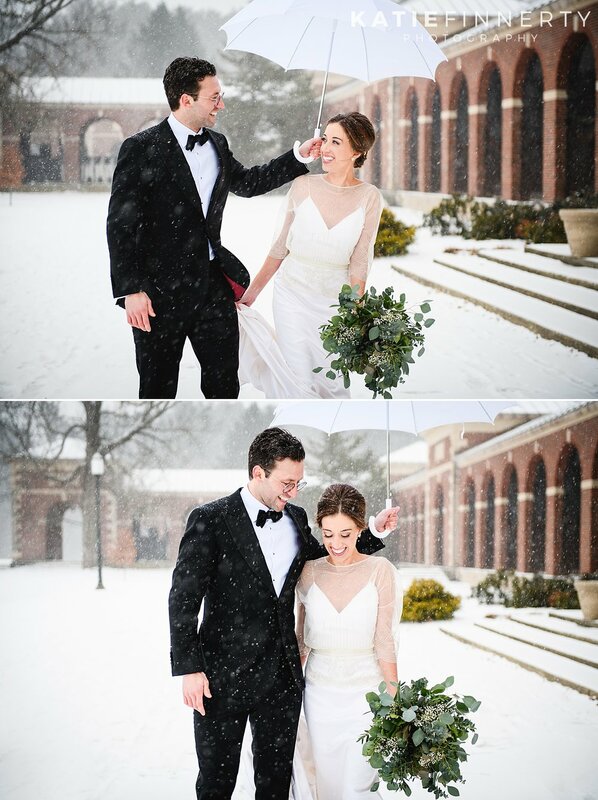 Those images are my favorites of the day, and I loved seeing how Katie & Seth couldn’t stop smiling at each other even when they probably couldn’t feel their fingers or toes – THAT IS LOVE! 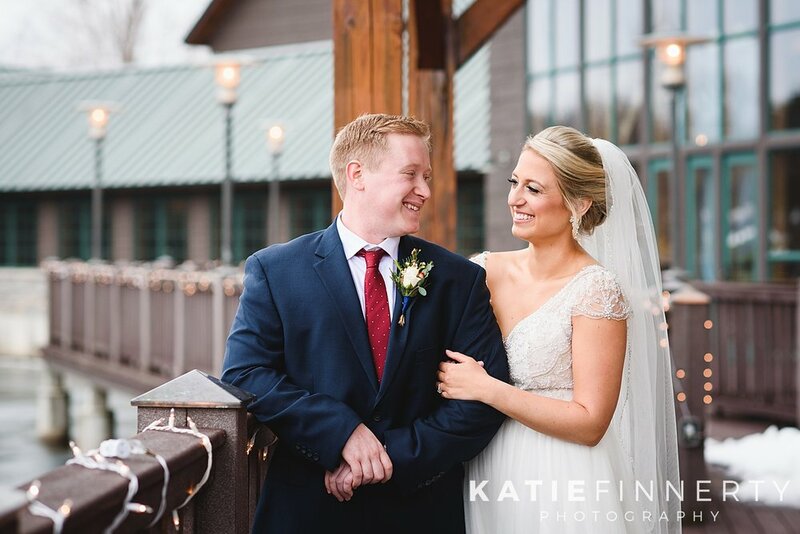 Their wedding was at the Hall of Springs in Saratoga which is a gorgeous venue nestled in the middle of Saratoga State Park, and the surrounding landscape is especially beautiful when it’s been turned into a winter wonderland! Their ceremony and reception all took place in the venue’s elegant grand ballroom, and there were all the things that make an unforgettable wedding celebration: heartfelt vows, lots of happy tears, hilarious speeches, an incredible first dance, great music, and a lot of enthusiasm on the dance floor!! Katie & Seth are such gracious, kind, and fun people and I’m honored that they trusted me to photograph their wedding day. I can’t forget to mention how much we enjoyed all their family and friends as well, the whole group was outstanding and I’m so excited to share some of my favorite shots from the with you all here, enjoy! 2018 was another fantastic year at Katie Finnerty Photography! I had the privilege of photographing so many incredible couples for their engagement sessions, or just because! You really don’t need a special occasion to get photos taken with your significant other, because it’s ALWAYS a good idea to document moments and memories with the person you love! How many couples have been together for years and still have NO photos of themselves besides crappy quality cell phone shots that we eventually have to delete to clear space on our phones!? I have so much fun at these sessions, hanging out with and getting to know my clients, and photographing them in some truly beautiful places. I photographed engagement sessions in all of the various climates Rochester, NY has to offer (and the weather is most definitely all over the place here!! ), from heavy snowfall to hot & sunny summer nights! I kept it mostly local this year because there are so many gorgeous places in the Rochester area and nearby in the Finger Lakes and Buffalo, but I also got travel to Syracuse, Central Park and the Upper West Side in Manhattan, and Saratoga for some of these sessions! So thankful for every single person in the photos below who gave me the incredible honor of photographing them this year, and I couldn’t be more excited for those who have weddings coming up this year!! Loved looking back and picking out some of my favorite images from 2018 to share with you here – enjoy! P.S. Best of 2018 Weddings post is coming soon!! Laura and Matt’s winter wedding was my last one of 2018, and I can’t imagine a better day to finish off another fantastic wedding season! I had a great time getting to know these two during their engagement session last summer and knew their wedding was going to be one for the record books! When I arrived to Laura’s room in the Marriott Syracuse Downtown the morning of her wedding, I was greeted so warmly and could tell right away what amazing friends and family Laura & Matt have. Throughout the day, everyone was so sweet and clearly over-the-moon happy to be celebrating such a special occasion. After all the details were photographed and Laura was in her dress (which she looked STUNNING in by the way) everyone headed to the Lodge at Welch Allyn in Skaneateles where Laura & Matt shared an emotional First Look! I love the photos from this part of the day on the back deck of the lodge. Afterwards we took a ride into the village of Skaneateles for some photos of the bridal party on the water, before heading back to the Lodge for the ceremony and reception. This was the third wedding I’ve photographed at this venue, and they’ve all been winter weddings! This isn’t too surprising; the rustic yet elegant vibe of the space make it feel almost like a ski lodge – perfectly cozy for tying the knot in the winter, with a massive wall of windows that let in plenty of natural light! The way these two looked at each other as they said their I do’s and how they beamed out at their loved ones after they were officially pronounced Mr. & Mrs. was another one of my favorite moments of the day. I also loved how quickly the vibe of the day changed from heartfelt ceremony to PARTY TIME with flashing lights, a smoke machine, and bridal party entering the reception to be greeted by a tray of shots for them to take as they entered! Needless to say, this dancefloor was crazy in the best way, and I had so much fun photographing it! Here’s a handful of favorites from the day, enjoy! Happy New Year everyone! The end of 2018 was such a whirlwind for me; I had an incredible holiday from Christmas with family, to one of my best friend’s weddings, to ringing the New Year in with friends. Hope everyone else sent 2018 off with a bang as well, and that everyone’s year is off to a fantastic start! Mine most definitely is because I spent the first few days of 2019 working on Ashley & Matt’s wedding and reliving this day makes me so happy! These two tied the knot on an early December day at the Avanti Mansion in Hamburg (just outside of Buffalo) and it was perfect! I started off the day at their hotel for candids of Ashley getting ready and detail photos, and I kept getting distracted in the best way by the extreme cuteness of the flower girls which you’ll see in the photos below; they definitely weren’t camera shy! Ashley looked GORGEOUS in her wedding gown and I was so excited for Matt to see her during their First Look at the Avanti Mansion. I was thrilled Ashley & Matt were completely on board for a First Look, because with the early sunsets here this time of year it would’ve been impossible to get many daylight photos if we weren’t able to do so before the ceremony. Ashley & Matt clearly have great style, the color scheme of the guys’ navy suits, gold sequin bridesmaid dresses, and white flowers with flowing greenery and pops of red berries was just SO GOOD. We finished up with outdoor photos just as it was getting dark and headed inside for their ceremony which was definitely one of the most special parts of the day. Afterwards it was party time, and after some pretty epic first dances, hilarious and heartfelt toasts, and a delicious dinner, the dance floor was packed all night! So thankful I got to capture this incredible day for Ashley & Matt and I’m excited to share a handful of my favorite shots with you here! Enjoy! I am so grateful that couples as incredible as Vicki and Jake give me the honor of photographing such an important day in their lives! They tied the knot in November on one of the last fall weather days we had here in Rochester, and the whole day was a beautiful celebration of love. Family and friends traveled from near and far (even from Australia!) to join in the festivities, and the importance of family to Vicki & Jake was a really special part of this day, it’s clear they have a great community supporting them as they enter this new chapter of their lives! Their ceremony was at the Greek Orthodox Church of the Annunciation on East Ave, which is gorgeous inside! Jake’s face as he first saw Vicki walking down the aisle toward him was priceless. Some grooms get a bit nervous and distracted by the crowd staring at them during this part of the day, but Jake only had eyes for Vicki. After these two shared their first kiss and were pronounced husband and wife, the exited the church positively glowing with joy, and the guests gathered outside to throw rice on the newlyweds as they left the church! Before heading to their reception at the Hyatt Regency Rochester, we stopped at the George Eastman Museum where Vicki + Jake had reserved the West Garden for photos of them and their bridal party. If you follow my blog you know I’m obsessed with this location, and I was thrilled to see how bright and vibrant the colors of the foliage were – I hadn’t been sure what to expect in mid-November! The photos from this location are probably my favorites from the day! The Greek dancing at the reception was another one of my favorite parts, there was just such a sense of love, family, connection and FUN! Happy tears fell, dollar bills were constantly flying through the air, and I’m pretty sure every single guest was on the dance floor at one point! It was an unforgettable celebration and I’m so thankful I got to document it for Vicki & Jake! Here are some of my favorite images – enjoy! Vicki and I went to college at Geneseo together and I LOVE HER! She’s an all-around incredible person and I was so excited when she asked if I could photograph her and her fiancé’s engagement session! We did this shoot in early November and we really lucked out with the weather considering it was just a fews days later that snow came to Rochester, and it’s pretty much stayed since! This was one of the last days that really felt like fall, and although a lot of the leaves had already fallen we were able to find a few perfect spots where the trees were still full of color! We started in the village of Pittsford, where Vicki and Justin have spent a lot of time together, and then we headed to Mendon Ponds Park for the second half of the session! These two are so laid-back and fun and photographing them was a breeze! Kerri & Derek’s anniversary session was definitely one of my favorite shoots of this year and I’m so excited to share some of the images!! Kerri is a fellow photographer and she shares my love of beautiful light, so I was honored when she reached out about this shoot! When she and Derek tied the knot last October, it ended up raining all day so although she has beautiful images to remember their wedding by, she didn’t end up with any of that golden hour light that we obsess over! They even decided to change back into their wedding day attire for the second half of the session, which I was SO excited about! Kerri and Derek live in Cazenovia so both locations were local to them and new to me, but I knew Kerri would choose some spectacular places and I was right! We started out at Lorenzo State Historic Site in Cazenovia where we strolled around among the fall foliage, flower gardens, and vine-covered walls and I had so much fun capturing the love and laughter between these two, they’re completely adorable! When we finished up there, we made our way to Red Barn 20, Windridge Estate and I immediately fell in love!! This location has everything I could ever want - from the red barn that inspired it’s name, to an old historic estate, incredible views of the sprawling hills and lakes below, grassy fields, etc! When we arrived, Kerri & Derek changed back into their wedding-day attire (Kerri’s wedding dress is STUNNING) and they looked incredible!! I was so happy when I learned that they planned to renew their vows, and I’m honored that I had the privilege of capturing such special memories for them! Here are a handful of my favorite shots from the session - enjoy! !